Founded in January 2013, Innovations for Peace and Development (IPD) is a research program at The University of Texas at Austin with the mission to provide a space for interdisciplinary, policy-relevant research on conflict, governance, and poverty alleviation, both domestically and abroad. At its core, IPD provides mentored research opportunities for graduate and undergraduate students. We are very proud that since our start over 400 students have been involved with IPD, as student researchers, summer interns, and graduate research fellows. ​Our students have gained invaluable professional and research skills and have gone on to intern and work in the domestic and international arenas. We welcome students across all disciplines and levels. Get involved today! Read more about IPD here. South Africa's history of colonialism and apartheid has generated socioeconomic inequalities that persist today, most prevalently in land ownership. Despite comprising only 9.1% of the population, white South Africans own 72% of land and earn on average 6 times more than their black South African counterparts. However, South Africa may soon witness a substantial change in property rights. A constitutional amendment regarding land reform, also known as expropriation without compensation (EWC), was recently proposed by President Cyril Ramaphosa and is currently making its way through the South African Parliament. The proposed policy would enable the government to take ownership of privately owned land, without compensating the owners, and redistribute it in an attempt to reverse the inequality in land ownership. This has raised concern among foreign investors and governments about the future economic stability of the already shaky South African state. Last semester, we researched three aspects of the land reform debate in South Africa: petitions, domestic (regional) public opinion, and foreign political perspectives.The regional public opinion team used Google Trends data to analyze subnational variation in support for EWC among South African states. The petitions team focused on analyzing public petitions that emerged regarding EWC. Finally, the foreign political perspectives team explored international actors’ motivations for taking a stance on EWC. While the future of the proposed EWC legislation is uncertain, it may not remain so for long. South Africa’s upcoming national election, likely to be called this May, will serve as an indicator of public support for EWC. If the African National Congress - President Ramaphosa’s party - performs well, it may signal that South Africans support the proposed legislation. Regardless of the election’s outcome, one thing is certain: as South Africa deliberates over potential changes to its property rights landscape, the world will be watching. I was born in Austin, Texas, but my parents are first-generation immigrants from India. A few summers after I had gotten my first period, my family and I made one of our many trips to see family in India. I had brought my own sanitary napkins, but I struggled to maintain my own menstrual hygiene while in India because of the lack of clean toilets. I wondered what Indian women did while on their periods, especially if they were in even more rural areas. I became so curious, I turned to my mom, and finally to my grandma, who told me she used to use a rag or cloth when she was on her period. At that time, I couldn’t understand how you could keep using one rag while on your period, because in America we don’t have to think twice about it. As I did more research, I learned from UNICEF that 28% of the students in India do not go to school during their period, due to lack of facilities and materials. They’re forced to hide due to cultural taboos, which means they can’t often dry their cloths properly and they can pick up dust which can lead to infections that can greatly alter their lives. I knew we had to do something. The power of networks is a central interest for the Global Indices Network Project. We deconstruct indices of global ratings and rankings in order to study their connections and relationships, which reveal information about the power of the indices within the network. How linkages form in this network of indices, how many times an index is used in the creation of another index, and how much weight the information from one index holds in another index are some questions we address. What does the networked power of global indices really mean for the GIN Project? For the purposes of our research, networked power has a much broader meaning than simple linkages between indices. These connections matter, but more generally, we are most interested in the indices’ power to influence the structure of other indices, as well as their power to change actions of real-life actors. Different conceptual measures of how an index influences the network can be found both within and from outside the immediate network of deconstructed indices. The directionality and overall connections within the network may constitute an index’s power; its ability to generate attention and to affect actors outside of the network space may also lend to its influence. These concepts of power are discussed in more detail below, with some examples from our preliminary network. Welcome Dr. Rachel Wellhausen as Co-Director of IPD! Dr. Wellhausen is an Associate Professor of Government at the University of Texas at Austin, with courtesy appointments at the McCombs School of Business and the Center for Russian, East European, and Eurasian Studies. Her research in international relations and international political economy focuses on the impact that multinational corporations, financial markets, international institutions, and political risk have on development. She also works on development issues within the United States, particularly regarding American Indian tribes and US territories. Rachel has published in the American Political Science Review, the Quarterly Journal of Political Science, International Studies Quarterly, the Journal of Conflict Resolution, MIT Press, and other outlets. In her book, The Shield of Nationality: When Governments Break Contracts with Foreign Firms (Cambridge University Press 2015), Rachel uses firm nationality to explain conflicts between host governments and multinational corporations. Learn more about Dr. Wellhausen here. "In a recent column in The Hill, the authors contend that preserving and bolstering cargo preference requirements — the law requiring U.S. shippers to use U.S. flagged vessels to transport “government-impelled ocean-borne cargo” — is crucial to maintaining America’s standing in international trade, carrying out the nation’s humanitarian agenda, and projecting U.S. military power overseas. Our findings and those of others, including Christopher Barrett of Cornell University and Vincent Smith of the American Enterprise Institute and Montana State University, suggest otherwise." Read the rest of Dr. Lentz's article here. Congratulations to the IPDers that were accepted into the Next Generation Scholars Program at the Robert S. Strauss Center for International Security and Law! Congratulations to the following students that will be interning in Washington, DC and Tanzania over the summer with support from IPD! Congratulations to the following IPDers for making the 2018 Dean's Distinguished Graduates list! "Since 2013, over 400 students have been part of Innovations for Peace and Development. They participate as student researchers, summer interns, and research fellows. They come to IPD because they are hungry for research experience. They are eager to engage in the world. And they really want to attain the skills and experiences needed to move into post-graduate careers. Getting IPD off the ground over the past five years has been a lot of work and has put more than a few gray hairs on my head. But without question, it’s been the most rewarding thing I have ever done in my 15-year career as a university professor. And I hope that, at the end of the day, IPD provides something valuable back to the University of Texas, our community and our state, and helps to realize our university motto: that what starts here changes the world." Read the rest of Dr. Weaver's remarks here. Congratulations to Eun Young Kim, member of IPD's Global Indices Network (GIN) Project. Eun Young was just awarded a University of Texas Continuing Graduate Fellowship. This very prestigious fellowship covers full tuition and a monthly stipend for the 2018-19 academic year. Well deserved, Eun Young! Your IPD family is so proud and happy for you! Karla Howard is a second-year undergraduate Government major at the University of Texas at Austin and has been with the Data4Peace Team since the fall of 2017. She has worked on projects that examine the FARC integration in Colombia and is currently working on evaluating a draft for the IPA Peace and Recovery Expression of Interest. The study, if funded, will be focused on the implementation of the CBM evaluation of UN peacekeeping interventions which will measure trust and accountability in nation-building efforts. She has also helped update the Data4Peace Team section on the IPD website. Learn more about the Data4Peace work here. Elizabeth (Liz) Teare is a senior studying International Relations and Rhetoric with minors in Middle Eastern studies and French. Her research interests include conflict and peace studies, as well as international development. She spent most of 2016 living in France and studied at SciencesPo as apart of a Franco-Anglophone exchange program. She spent summer 2017 interning with an edu-tainment social enterprise in Dar es Salaam, Tanzania, working on multiple marketing and business development projects. Elizabeth is working on an IRG honors thesis researching peace-building programs and the importance of education in regards to development and conflict. After graduation, she hopes to pursue a career that links her marketing experience and interests in peace-building and development policy. Liz is the only undergraduate task team leader at IPD and currently leads the Chinese Development Finance team. She manages and edits the CDF's news digest, blog site, and analytical reports. Read Elizabeth's CV here and read more about the CDF's amazing work here. Ever wondered what our work looks like in action? Learn more from this new video about IPD! IPD - Intro from Wienot Films on Vimeo. IPD is always looking for student research affiliates! Please submit an interest form through the Get Involved! bar. We will be reaching out to interested students early January 2019. 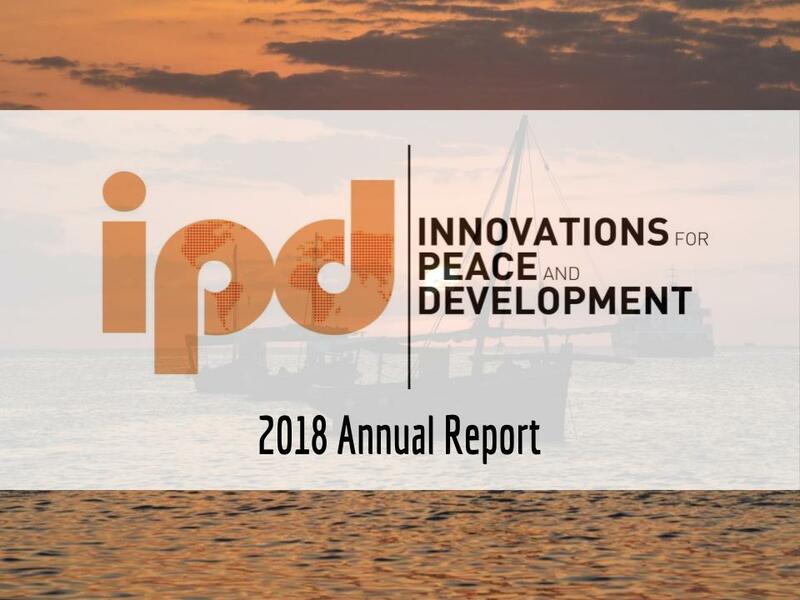 Download IPD's 2018 Annual Report and learn more about our research initiatives, global partnerships, internships, and publications. To receive updates on our research, publications,internship opportunities, and development news, join our mailing list.